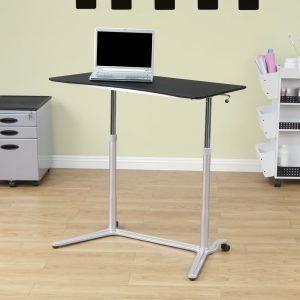 The Studio Lift 26” Sit-to-Stand Desktop Riser by Calico Designs makes any standard desk or table a standing desk. The gas lift easily lowers and raises the main work surface from 7.25”-18.75” with a lever located under the desktop. By standing during your workday, you can alleviate stiff back pain, and improve circulation. The large 23.5” wide keyboard shelf is optional if using a laptop. 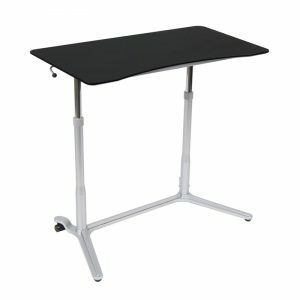 This height adjustable desk converter is an ergonomic and affordable solution for those looking for the benefits of a sit-to-stand desk. Available in White (Item # 51243), Black (Item # 51244) or Silver (Item # 51245). Also available in a 32“wide top in White (Item # 51246), Black (Item # 51247) or Silver (Item # 51248).